If you're on the pathway to restoring your health by strengthening your gut, you need an action plan to be successful. A huge component of your healthy-gut action plan is to have an arsenal of healthy and delicious -- not to mention easy -- meal recipes at the ready. You may start to see your health improve even more when you stop using your microwave oven. There's so much more where this came from. You can find 250 healthy-gut, healthy-mind, and healthy-body recipes in The Body Ecology Living Cookbook, filled with fulfilling foods for all seasons. Most people in our Body Ecology community see great success in energizing their bodies and restoring their gut health by trying several new things every week. You may start making cultured vegetables at home. You can also prepare big batches of nourishing soups and entrées and freeze the rest for later. You may start to see your health improve even more when you stop using your microwave oven. 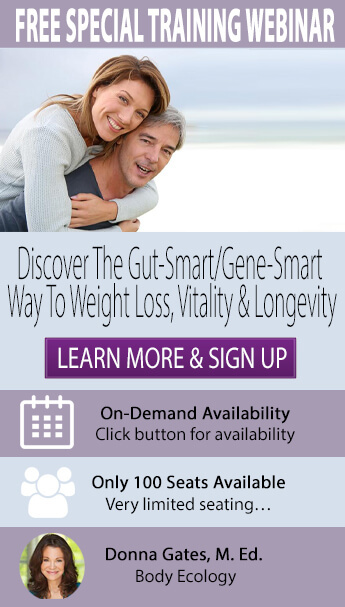 Struggling with excess weight, hormonal imbalance, celiac disease, Candida, acne, infertility, and more? It's time to take back control. Change can seem overwhelming at first, but please keep things simple by following the Body Ecology Principle of Step-by-Step. Begin by making this hearty and healthy (and simple) spaghetti squash recipe for your family, using the Instant Pot instead of the nutrient-depleting microwave oven. Watch how your body responds to the healing foods you've given it and continue to make small changes on your road to recovery. Because your gut deserves better. Learn how to become a fermented foodie. Insert the steam rack into the Instant Pot and add 1 ½ cup water. Place the spaghetti squash halves on the rack and lock lid. Pressure cook on high for 15 minutes, then use the Quick Release method and open lid. In a small bowl combine the Lakanto, sea salt, and red pepper flakes. Set aside. Lift out the squash, and taking two forks, shred the squash into long strands and put onto a large plate. Pour out the water and dry the pot. Press sauté’. Melt the ghee in the pot, then add the garlic and cook, stirring constantly until light brown. Add Lakanto and stir until well blended. Lift out the inner pot and add spaghetti squash to combine. Serve.